When you knit with hand-painted yarns, bright and bold results are easy to achieve! 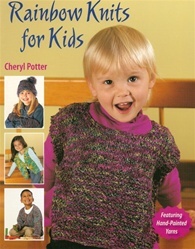 Knitters looking for adorable designs for little ones will find lots of fun choices in this playful collection. Over two dozen projects for children ages three to eight include sweater sets, hats, mittens, ponchos and more. These patterns feature a wide variety of yarns and yarn weights, so you'll have lots to choose from! My granddaughter will love the new things I can make for her from the patterns in this book. She is a real budding "Fashionista."